Editor’s Note: Did you miss part one of this series? Go read it now. We’ll wait. Miller averaged twenty three points per game last season at NCHSAA 2-A Clinton HS, and recorded over seventy-five dunks in his junior season. He had been recieving interest from coaches at UTEP, ECU, Virginia Tech, Miami, NC State, Oklahoma, Gerogia Tech, Wake Forest, UNC-Greensboro, UNC-Wilmington, American University, The Citadel, Western Carolina, and others before July 2011 according to his father Dwight Miller. In May 2011, JT suffered a knee injury at the Bob Gibbons Tournament. He is now back to one-hundred percent , and is starting to get interest back from coaches who may have backed off (because of the injury) including Virginia Tech, University of Miami, and VCU who have also recently watched Miller work out. Clinton HS is now coached by Levi Beckwith, the former coach at Word of God in Raleigh, NC. The Science Hill (TN) transfer and Alabama commit Hale, is a very strong post player and gets plenty of rebounds. I saw him play in the Christ School Tip Off Tournament in Asheville (NC) against NCISAA power Greensboro Day (NC) which Hale scored twenty-two points. Hale showed above-average athlesticism and some speed as he gets up and down the court in a hurry for a big guy. He is ranked by many publications as a top seventy-five recruit for the 2013 class. Jones has offers from American University, Seton Hall University, North Carolina Central University, East Carolina University and Georgia Southern University. Last season Jones along with Anton Gill (more on Gill later) led Ravensvroft to a 23-4 record. He is getting recruited the most by American University, Seton Hall University and East Carolina University. Hanner averaged 18.5 points per game last season as a junior and led the Cowboys to a 22-6 record. He informed me the only school really showing interest in him for basketball is Mount Olive. Southwest Guilford competes in the 4-A Piedmont Triad COnference. The former Winthrop commit has informed me that he is setting up visits to College of Charleston, Appalachian State University, and Hampton University. Haywood played last season at the now closed Waddell High School in Charlotte (NC) and averaged 22.2 points per game on a squad that finished 18-11. He has started the 2011-2012 season strong with a 23 point, 10 rebound and 7 assists against Hopewell HS Charlotte (NC) in a 25 point win. The 6’4 175lb guard is ranked as the 55th best shooting guard prospect in the country by ESPN.com. The long and very athletic Allen, transferred to Word of God after playing at Cary High School and re-classified to the class of 2014. Allen shows great ball-handling skills for a player of his size and gets to the basket with ease. He informed me that he is getting the most interest from Bucknell right now along with UNC-Charlotte, West Virginia University and VCU are showing him a little interest and have been in contact with his AAU coach. He needs to add some muscle and weight but he is only a sophomore, so he has a few years. One of the quickest cross-overs you will see this year comes from Newkirk. Hailing from the same high school as current Washington Wizard John Wall and NC State star freshman CJ Leslie, Newkirk is ranked by ESPN.com as one of the top ten players in North Carolina in the class of 2013 and the 17th best overall point guard in the country. He let me know that he has offers from University of Arizona, Oklahoma State University, Indiana University, North Carolina State University, Appalachian State University and The University of Tennessee. Josh averaged close to 15 points, 8 assists and 3 rebounds a game last season as a sophomore. He also informed me that he is getting interest from Miami University and The University of North Carolina at Chapel Hill, but has not been offered a scholarship yet by either school. 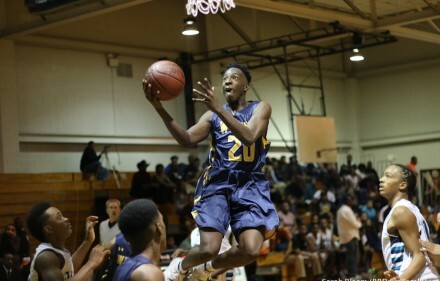 Smooth-shooting Jevon Patton averaged 17 points, nearly 6 assists and 6 rebounds a game last season for Highland Tech, leading them to a (17-9) record in the Piedmont 1-A/2-A conference. He is starting to gain some interest from College of Charleston, Clemson University, and The University of South Carolina. Patton’s father Jody is an assistant coach with Highland Tech and was a three-year all conference player at Coker (SC). The Greensboro (NC) Day School transfer, Chapman is a long and very athletic wing for Kevin Gatlin’s WCA squad this year that also includes 6’4 Theo Pinson (one of the top prospects in 2014) and Florida State recruit 6’6 Montay Brandon. He informed me via text message that he has two Division One offers, from The University of Pennsylvania and Jacksonville (FL) University. He also mentioned that he is receiving “a little interest from Appalachian State University, Virginia Commonwealth University (2011 NCAA Final Four participant), Liberty University, Stanford University, and East Carolina University”. Dasent picked up his first offer a month ago from Mercer University, and is getting interest from Clemson University, The University of South Carolina, and The University of North Carolina at Charlotte. He mentioned to Alex Kline of TheRecruitScoop.com that UNC-Charlotte and South Carolina are his very early top two. Editor’s Note: Are you wondering why we missed some players? Go read part one now. Then come back and read parts 3,4 and 5 when we publish them.